From its perch, high on a Ridge, the NASA - Mars Opportunity Rover recorded this image of a Martian Dust Devil twisting through the Valley below. The view looks back at the Rover's Tracks leading up to the North-facing Slope, nicknamed "Knudsen Ridge", which forms part of the Southern Edge of another location known as "Marathon Valley". The NASA - Mars Opportunity Rover took the image using its Navigation Camera (or "NavCam", for short) on March 31, 2016, during the 4.332nd Martian Day, or Sol, of the Rover's work on Mars. 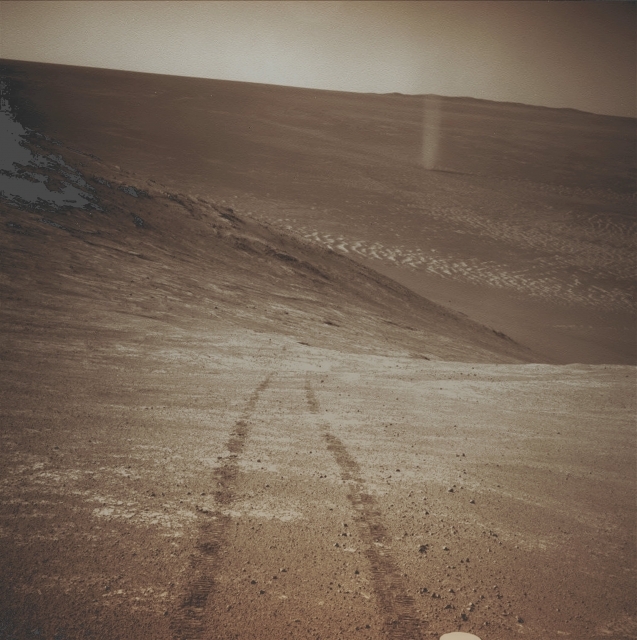 Just out of curiosity - and as a matter of fact - the Dust Devils (---> mini-Hurricanes) were a common sight for Opportunity's twin Rover, now decommissioned, such as the NASA - Mars Spirit Rover, in its outpost at Gusev Crater. The aforementioned Dust Devils have been, so far, a truly uncommon sight for Opportunity. Just as on our Home-Planet Earth, a Dust Devil is created by a rising, rotating column of hot air. When the column whirls fast enough, it picks up tiny Grains of Dust from the Ground, making the Wind Vortex visible (here, we can also see its shadow!). During the uphill drive to reach the top of Knudsen Ridge, the NASA - Mars Opportunity Rover tilt reached 32�: such as the steepest ever for any Rover on Mars. This picture (which is an Original b/w Image obtained by the NASA - Mars Opportunity Rover on March, 31, 2016, and identified, on the NASA - Planetary Photojournal, by the ID n. PIA- 20012) has been additionally processed, magnified in order to help the visibility of the Landscape's details, Gamma corrected and then colorized in Absolute Natural Colors (such as the colors that a normal - in the average - human eye would actually perceive if someone were on the Surface of Mars, near the NASA - Mars Opportunity Rover , and then looked ahead, towards the Horizon and Sky above Endeavour Crater), by using an original technique created - and, in time, dramatically improved - by the Lunar Explorer Italia Team.